Museum /Galleries. You can visit National Museum and Art Gallery. In a half day walk you can see the Clock Tower, Skanderbeg Square, Ethem Bay Mosque and Pyramid. During these days there are open many exhibitions and art galleries in Tirana. There are some festive concerts organized from Tirana Municipality. 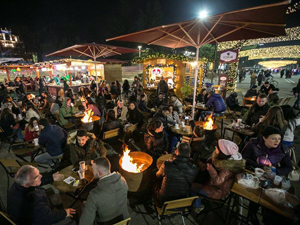 We suggest you to see the Christmas lights and décor from Skanderbeg square to Mother Teresa Square including the Christmas market there. 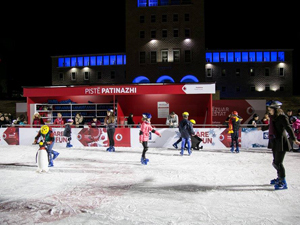 You can enjoy the lively night life, a hot coffee or Albanian wine and why not an ice skating in the open area. From there you can walk to Bllok area to enjoy life music, lively bars and restaurants. Tirana is a great place for food. Very good restaurants of Italian and Albanian cuisine for reasonable prices. We suggest Pizzeria Era, Juvenilja, Oda restaurant, Tajvani restaurant etc. For drink you can choose Sky tower a rotating bar, but also many bars in Block area. The street food also tastes great, especially byrek. You can take the cable car and climb to Mountain Dajti, wonderful experience. Enjoy the view of Tirana from Dajti Mountain and also eat traditional lunch at the restaurant on the top; play with snowballs and ride a horse. You can go to Petrela Castle, have a good lunch and enjoy the view of Tirana. The Tirana Mosaic is one of the oldest monuments discovered in Tirana thought to have been part of a Roman house built in the 3rd century AD. Later in the 5th and 6th centuries, a church was built at this site. The ruins of this Paleo-Christian Basilica were discovered in 1972. Today, the site displays some of the ancient mosaics discovered that feature diverse geometrical patterns and depict poultry and fish. It has been re-opened for public on 23 January 2010 and is situated on “Naim Frasheri” street. Castle of Tirana also known as Fortress of Justinian dates back before 1300 and is a remnant from the Byzantine-era. The fortress is the place where the main east-west and north-south roads crossed, and formed the heart of Tirana. About all that's left of the fortress above ground is a 6m-high Ottoman-era wall. The recently uncovered wall foundations were incorporated into the pedestrian Murat Toptani Street. Ethem Bej Mosque Construction was started in 1789 by Molla Bey and it was finished in 1823 by his son Haxhi Ethem Bey, great-grandson of Sulejman Pasha. Closed under communist rule, the mosque reopened as a house of worship in 1991, without permission from the authorities. 10,000 courageous people dared to attend and remarkably the police did not interfere. The event was a milestone in the rebirth of religious freedom in Albania. Take a look at the frescoes outside and in the portico which depict trees, waterfalls and bridges, rarely seen in Islamic art. 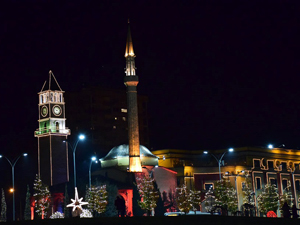 Tirana’s Clock Tower was built in in 1822 by Haxhi Et`hem Bey, who also finished the building of the Et'hem Bey Mosque. The stairs have 90 steps that go in a spiral fashion. It is 35 metres (115 ft) tall and was the tallest building in Tirana at the time. The clock tower originally had a bell from Venice that marked the time every hour. 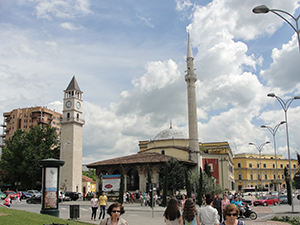 In 1928 the Municipality of Tirana purchased a new clock in Germany to replace the existing one. The clock was destroyed by bombardments during World War II and was replaced in 1946 with a Roman numeral clock from a church in Shkoder. In 1970 the Roman numeral clock was replaced by a Chinese clock. Access to the top of the tower has been available free of charge since 1996. 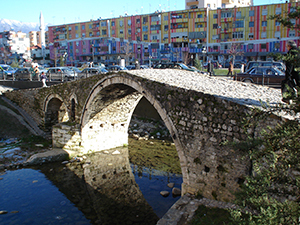 The Tabakeve or Tanners' Bridge was part of the road that connected Tirana with Debar through Shëngjergj. It was an important axis which linked Tirana with the eastern highlands of the city, and was mainly used by caravans of farming products or livestock to be butchered in the city. Butchers and leather tanners were commonly known as Tabake, hence the road and later the bridge assumed this name. The bridge is considered a testimony of Tirana's urban development in the 18th century and of the increase of communication with the internal areas of Albania and hence has great importance for the municipality which completed its reconstruction in 2007. World Headquarters of Bektashi Order. Since 1925 when they were banned in Turkey, Tirana has been the primary centre in the world of the Bektashis, an order of dervishes who take their name from Haji Bektash, a Sufi saint of the 13th and 14th centuries. It was the same Haji Bektash who blessed the Janissaries, the famed Ottoman fighting corps that originally comprised non-Muslim conscripts, many of them Albanians. It is a liberal version of Islam with a more lyrical outlook on life and God. Tirana’s main boulevard was built in 1930 and given the name of the King, “Zogu I” (Zog the1st). In the communist period, the part from today’s Skënderbej Square up to the university rectorate building was named “Dëshmoret e Kombi” (Martyrs of the Nation) while the part from the centre to the train station was named Stalin Boulevard. After the fall of communism the Stalin Boulevard reverted back to the original name of “Zogu I”. The boulevard since its creation acts as a historical record of the last 100 years of Tirana’s development, as it is dotted with buildings erected in different periods of the history of the capital. The Bllok area of Tirana is where the villa of the former Communist dictator Enver Hoxha and other highest ranking Party officials was located and until 1990-s the area was heavily guarded by armed soldiers, making it one of the most forbidden places in Albania to the ordinary people. Today, the area is easily accessible to everyone but has become exclusive due to the trendiest cafés, bars, restaurants, shops and nightclubs of the capital being located there. Whether you want to glimpse at the villa of the dictator during the day while sipping a delightful cappuccino or have a gourmet meal and a delicious cocktail surrounded by fashionably dressed locals Blloku is the place to be. The Palace of Culture (Pallati I Kulturës), where the Theatre of Operas and Ballet and the National Library are located, was completed in 1963 on the site of the former trade building of Tirana, with the first brick being placed by Soviet president Nikita Khrushchev during his visit to Albania n 1959. 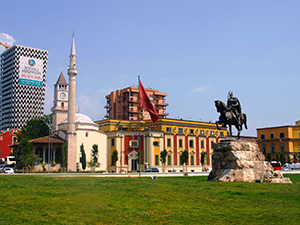 Scanderbeg Monument is an equestrian monument to Albanian National Hero Scanderbeg, raised in the main square in 1968. It is the work of sculptor Odhise Paskali in collaboration with Andrea Mana and Janaq Paço. It commemorated the 500th anniversary of the death of the national hero and replaced a statue of Stalin confirming the deteriorating relationship with the Russians, confirmed by Albania’s exit from the Warsaw Pact that same year. Mother Albania Monument is a statue portraying a woman with a star in the palm of her raised hand. It stand 12 metres tall and was inaugurated in the “Dëshmoret e Kombit” (Martyr’s of the Nation) cemetery in 1971. It is one of those imposing communist era statues which many people find interesting and peculiar therefore we think might be interesting to vist. The Gallery of Figurative Arts was created in 1976, and includes around 3200 works by Albanian and foreign artists. 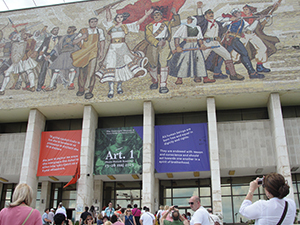 Of particular interest to visitors, is the section of works from the communist period, with painting and sculptures depicting the “achievements” of Albanian socialism. Although it was named Socialist Realism Art, the reality on the ground was very different to the one displayed and after the fall of the regime it was clear that this was propaganda forced upon the artists themselves and the masses. The National History Museum was built in 1981. The ornamental mosaic on its front is called ‘Albania’ and it represents the development of Albania's history with everyone from Illyrians to Partisans a piece of arts itself representative of Social Realism Art. Inside the museum is well cured and truly gives a detailed insight into the country’s and its peoples walk through the ages, from the Illyrians to present day. 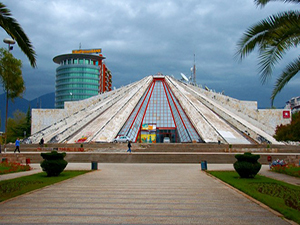 The pyramid as is referred to today, was formerly the Enver Hoxha Museum, inaugurated in 1988, three years after his death. It was designed by a group of architects under the direction of the dictator’s daughter, Pranvera, and her husband Klement Kolaneci. It is now The International Cultural Centre, but due to its ties to the past it has been mistreated by the ordinary Albanians and neglected by government. 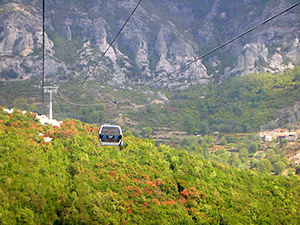 Dajti Mountain is considered by locals as one of the symbols of Tirana and has been tempting the city’s inhabitants and visitors alike with the promise of fresh air. Nowadays it's easier to scale the mountain, either by taking the Dajti Ekspres cable car, or by driving up to the national park. Your efforts will be reworded by fantastic vistas, lovely forests and several good restaurants.